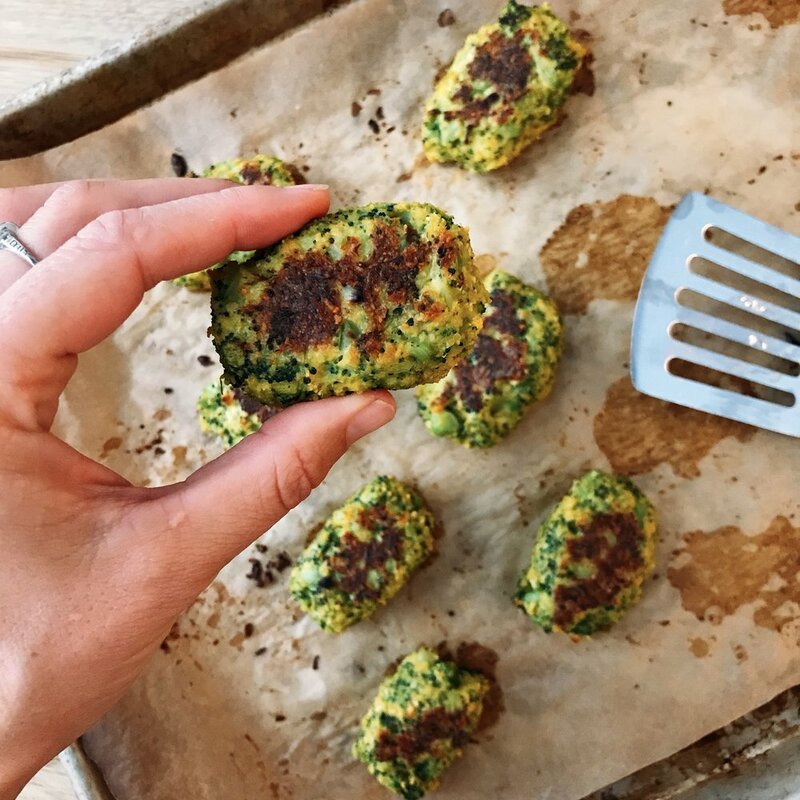 Crispy baked broccoli tots that are both dairy free and gluten free! Even though we didn’t have them too much in our home when I was growing up, I used to love eating tater tots- the pre-made ones from a package, dipped in tons of ketchup. They also served them at school as a “healthy” side, which I don’t think they were all that healthy when I look back on it- but the school considered it as a vegetable somehow. Anyways, I saw these floating around on a few different blogs and I have been meaning to make them for so long. I adapted the recipe from GimmieDelicious and I couldn’t believe how good they were. Granted, I do love broccoli, but I wasn’t sure how these were going to turn out, but - they were full of flavor, crispy, and surprisingly filling after a handful. They do require a little labor or love, but it was worth it because I made enough to last the entire week. Once you get past the prep work, they take less than 30 minutes to bake in the oven! You can dip them in ketchup, cream cheese, ranch, or anything you prefer! I would definitely give these a try even if you aren’t a huge broccoli lover, the taste isn’t overpowering especially when you use all of your favorite seasonings- I did a mixture of sea salt, pepper, turmeric, cayenne pepper, shredded cashew cheese (or nutritional yeast), and breadcrumbs! For the breadcrumbs I used a mixture of panko crumbs and almond flour. You can either use all breadcrumbs or a combination or breadcrumbs and panko; if you do not have any flour on hand. I haven’t tried any other flour, but I assume it will work! IF you do not have any breadcrumbs on hand, you can make your own by taking your favorite crackers and pulsing them into a fine powder in your food processor. You do need to use an egg for this recipe and I haven’t tested it with a chia egg, so I am not sure how it would hold up! Before you get started you need to boil the broccoli for 2 minutes, once they are drained of all liquid, you chop into smaller pieces. You can use your food processor to make it into a “broccoli rice” and save some time on chopping, but you want to make sure it doesn’t become a pure. I would suggest only pulsing the broccoli a few times. Once the broccoli is finely chopped, you mix it in a large mixing bowl with all of the ingredients; form into 2 tbsp. sized balls and shape them into tots! They are baked in the oven at 400 degrees for about 30 minutes, rotating them once about half way through! I used about 4 smaller heads of broccoli, which was about 4 + cups of broccoli and it turned out to me about 20 tots. After they were finished in the oven, we dipped them in ranch and dairy free cream cheese! They will keep for up to a week in the fridge; to re-heat simply place them in the oven at 375 degrees for about 10 minutes or under the broiler on high for less than 5 minutes. Chop the broccoli into fine pieces, almost so it resembles broccoli rice. If you are using your food processor, see above. Using your hands, roll into balls using about 2 tbsp. of the mixture. Then, form the mixture into “tots” / rectangular shapes.